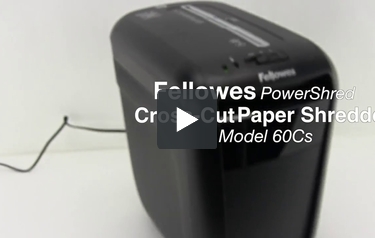 The Fellowes 60Cs Cross-Cut Paper Shredder is the perfect household shredder. Designed with sensor technology that prevents the blades from cutting if a hand touches the opening, the 60Cs shreds up to 10 sheets per pass at a P-3 security level. Additionally, the 60Cs also destroys credit cards, paper clips, and staples. Its pull-out 6 gallon bin makes waste disposal easy. Each unit comes with a 1-year warranty. Product number 4606001. Cut Size: 5/32" x 2"
Dimensions (HxWxD): 16.1" x 9.2" x 14.6"
Works perfectly right out of the box. I'm very pleased. It is quiet and works well. One of the best shredders I have purchased! It's been my favorite so far! I recently purchased the Fellowes 60Cs series shredder and have found it to be an excellent and reliable shredder. I have not had any paper jams and really like the safety features especially with grandchildren always trying to touch it with their hands. In addition, I have not had any problems with overheating. I highly recommend this product for home use. Received this beast of a machine as a gift and since then have bought another one. It works perfectly for home/office use. Love the bin, makes for easy disposal. The cross-cut is awesome. It's like having an army of ninjas at my disposal. Item works perfectly and is a powerful shredder. I like the finger safe device. I looked around online for shredders, and found this one on the Office Depot website. It had good reviews, and was a good price. Especially since it was cyber Monday! It works great, and I have had no issues with it thus far. One thing, if you put thick items in it, it has to work a little harder, but it shreds everything fine! I am quite pleased! This is MyBinding video. Let’s have a look at Fellowes PowerShred 60Cs, a cross-cut paper shredder with a level 3 security. Controls are simple right here in the front – the off position, reverse position, and an automatic forward. It shreds at 14 feet per minute and is office quiet. It does not shred CDs or DVDs, but does destroy credit cards, paper clips, and staples, as well as card stock and laminated materials. The 60Cs has a shred capacity of 10 sheets of 20-pound paper per turn. We gave this claim a test and it seemed to work just fine without hesitation. There is a reverse feature should there be a jam: simply slide it to the reverse position, back your project out, and begin again. The level 3 security shreds fall in a waste bucket, that is 6 gallons, just below the shredding unit and serves as a stand. So there you have it, the PowerShred 60Cs Cross-Cut Paper Shredder by Fellowes. For more demos, reviews, and how-to’s, check out MyBinding.com. Throat Width 9" 9" 9" 9"
Unit Dimensions (H x W x D) 16.1" x 9.2" x 14.6" 18.1" x 15.2" x 10.9" 15.38" x 9.13" x 16.94" 16.88" x 13.63" x 9.38"